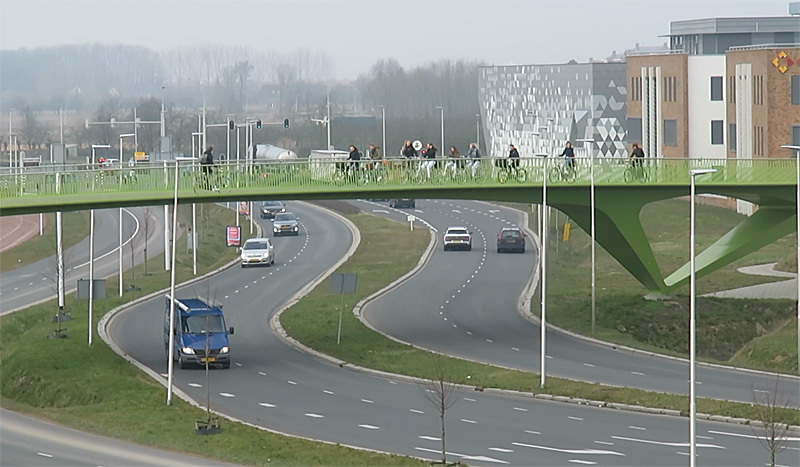 Nijmegen, Cycling City of the Netherlands? 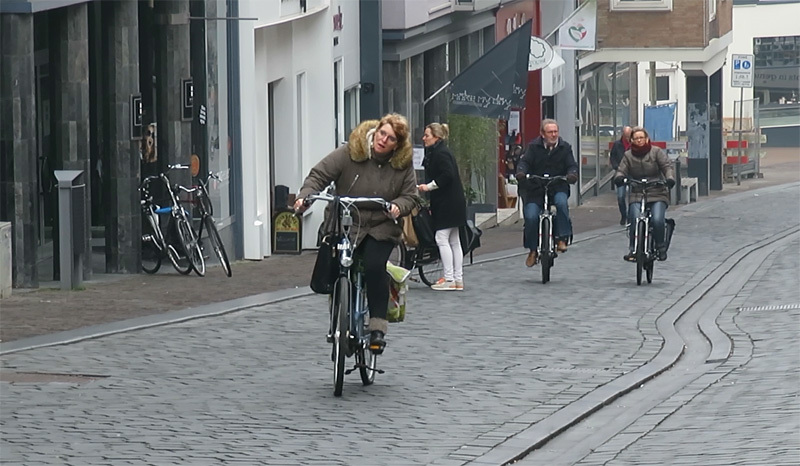 The results of 15 years of forward cycling policies are clearly showing in the streets of Nijmegen. A network of high quality fast cycle routes has been built, connecting major destinations in the city and extending to towns around it. There is even one that takes you all the way to the next city Arnhem. 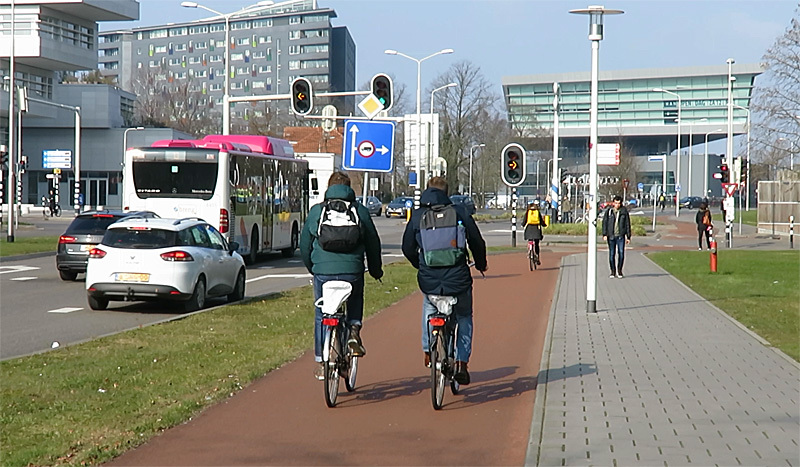 Nijmegen takes good care of its citizens who choose the bicycle for their daily journeys. The city feels it could become Cycling City of the Netherlands now. I agree. Nijmegen is a worthy finalist with good chances to win the title. The municipalities of Goes, Groningen, Maastricht, Nijmegen and Utrecht are the finalists in the Fietsstad 2016 competition for which the overall theme is “Bikenomics”. 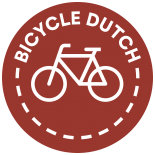 The Cyclists’ Union in the Netherlands regularly organises a competition in which municipalities can try to become Cycling City of the Netherlands. The last city to win the title was Zwolle (2014), which followed ´s-Hertogenbosch (2011), Houten (2008), Groningen (2002) and Veenendaal (2000). Before 2011 municipalities were chosen on the basis of the results of a cycling quality investigation by the Cyclists’ Union. From the 2011 election on municipalities have to enter the competition themselves. The 5 finalists were chosen by a jury on the basis of the written motivation, the policies and the figures about mode share, traffic safety and the type of cycling infrastructure in a municipality. On my blog I feature a video portrait of each of the 5 candidate municipalities. I publish these posts every other week, leading up to the announcement of the winner on 19 May 2016. The visit to Nijmegen to film the portrait in this post was certainly not my first. I already cycled a lot in and around Nijmegen and I have written many posts about a variety of topics and locations in this city. I think the cycle climate is very attractive, so I was not surprised that Nijmegen applied yet again for the competition. The city was a finalist in 2008, but at that time the jury stated that there weren’t enough parking racks and that the longer cycle routes were not up to the latest standards. In the 8 years since those remarks the city has invested a lot. The cycling infrastructure in the University area is of a great quality, as in most of the city. And how do we see that in the streets? The city writes that it feels it has influenced the cycling climate in a positive way. After years of ambitiously building the network, the streets have genuinely changed. 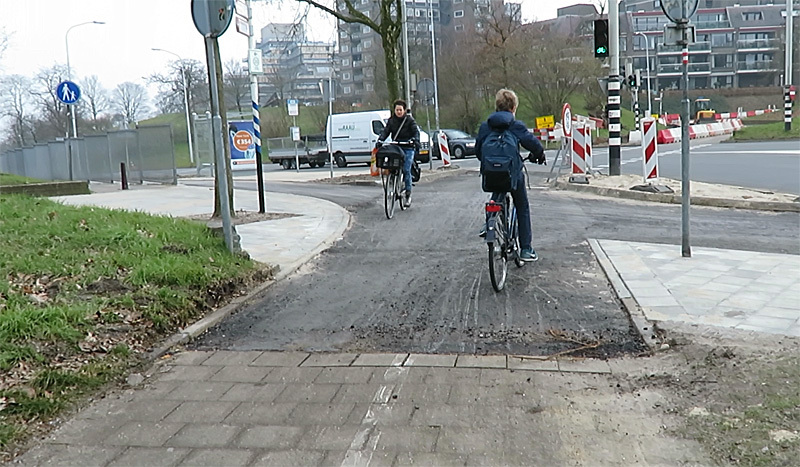 Not only in the way they look, but also how they are used: more for cycling. And then the city modestly states it has built half the desired fast cycling network in all of those years. This honesty is refreshing, especially compared to the hype around some cities and countries, but Nijmegen really doesn’t do its own work justice. I have visited the city often and the change for the better is very obvious. The parking deck near the main railway station of Nijmegen is but one of several parking facilities at the station. 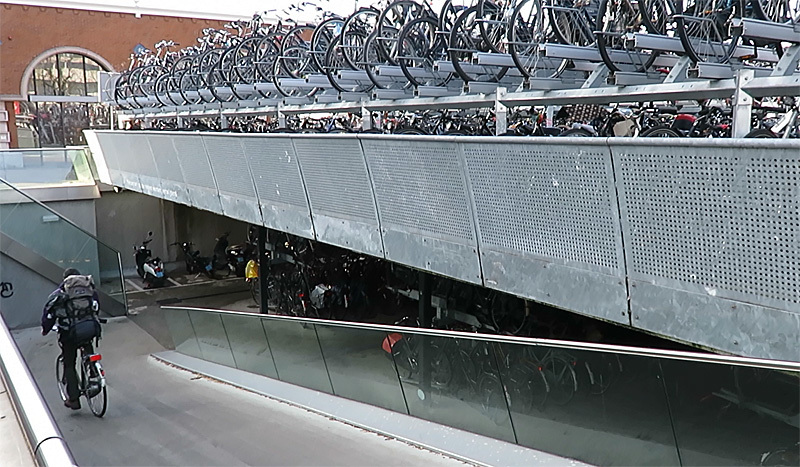 Parking your bicycle near the main railway station has been improved. An existing outdoor parking deck has been expanded and the recent indoor facility under the pop music hall Doornroosje is one of the better facilities in the country. The city has the right to boast about a long tradition of building large pieces of infrastructure. The huge cycle bridge, attached to the railway bridge (opened already in 2004) is proof. The newest pieces of infrastructure are all of a very high quality. I showed you the fast cycle routes to Beuningen and Arnhem and the new bridge over the river Waal, that also has a great cycleway. The 2.5 km route from the main station to the university campus is completely away from motor traffic and 4 metres wide. The drive to deliver what you promise is very apparent. A planned level crossing did become a grade separated crossing after all, when a small window of opportunity to allocate the necessary funds was seized at just the right moment. The overpass proudly features in the top 5 of the city’s best achievements (I mention the rest of this top 5 in my video). Nijmegen can also be proud that it is home to the International Cargo Bike Festival and that it will host the international cycling conference Velocity 2017 (in cooperation with Arnhem). School children use this overpass in high numbers. It was originally planned as a level crossing, but it became a grade separated crossing after all. Surface update. The concrete tiles in the foreground are being replaced with asphalt. The top layer of red asphalt still has to be put in place. Nijmegen is a beautiful historic city founded by the Romans. It was damaged considerably in World War II, when over 2,000 homes and 400 shops were completely destroyed. Unfortunately mostly by allied bombs. The city at the German border was mistaken for a German city. Unlike Rotterdam Nijmegen kept its original street pattern when the city was carefully restored and party reconstructed. Many of the streets in the city centre are now car free and clearly designed for the needs of people walking and cycling. Even the streets which are also used by buses. That makes the bus drivers careful and the buses not so intrusive. The city on the river Waal (that carries most of the water of the river Rhine, which splits right after entering the Netherlands) has 172,000 inhabitants. Almost 19,000 of whom are students from the Radboud University. Mainly in the east, in the direction of the German border, the city is a bit hillier. But the city centre has an upper and a lower part as well, with a considerable difference in altitude. This woman is struggling to cycle up the hill in the historic city centre. She managed! The couple in the background has a much easier task: they both ride an e-bike. No motor-traffic is allowed in this street. 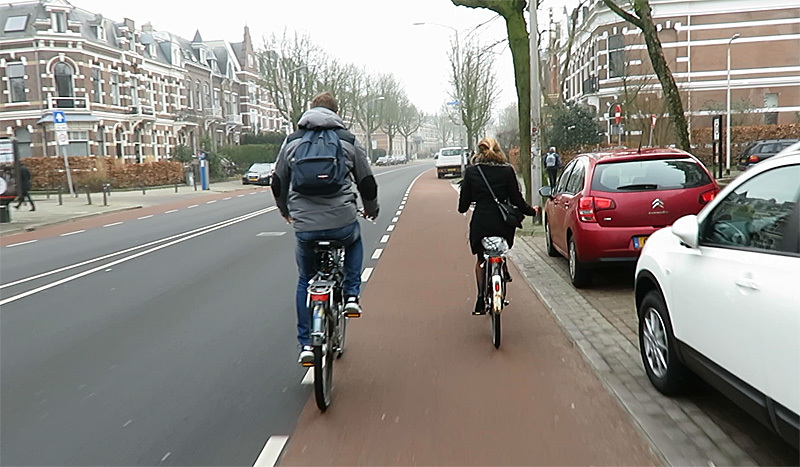 Nijmegen also has some main streets with on-street cycle lanes (partly obstructed in the distance). Cycling in Nijmegen is really enjoyable in my opinion. Even though there are also many streets with on-street cycle lanes, I have never really felt unsafe. The city doesn’t really seem to discourage the use of cars. It even built a new bridge and a new main road on the other side of the river in an urban expansion. But because of that road motor traffic is now partly diverted around the city and that means more space for cycling. The city even thinks it will be able to prolong green times for cycling at traffic lights for this reason. The city has a bit of bad luck that a main provincial road leads right through the centre. Crossing that N326 is not always nice on intersections that sometimes seem a bit outdated. Some of the cycling infrastructure is also a bit older, the surfaces in particular. Maybe there was a bit too much attention to the new fast cycle routes? In the near future the surfaces will be changed to smooth asphalt as part of a plan to upgrade existing cycling infrastructure. As the video shows, I already saw such reconstructions taking place. But I really had to dig deep to find these negative points. All in all cycling in Nijmegen is really attractive. That is why I think Nijmegen is a worthy candidate in this competition that would certainly deserve to win the title. I cycled through Nijmegen last week on a short cycling holiday. I agree – excellent infrastructure. Only Eindhoven on my recent trip could compare. While I was in the Netherlands, I also came across a city with surprisingly poor (by Dutch standards) cycling infrastructure: Breda. It just did not compare to the excellence seen elsewhere. It was still, though, years ahead of us here in UK. Perhaps I was just unlucky with my route through though? I think you may indeed have been unlucky in Breda. I do not know that city as particularly bad. In fact it is home to the first “cycle super highway” of the country! Excellent post. I’m an American who was fortunate enough to spend a week in Nijmegen last summer. This was great fun to read and watch as it allowed me to relive many pleasant memories. Keep up the good work and know that many of us in the states look to you for inspiration! This entry was posted on 5 April 2016 by Bicycle Dutch in Original posts and tagged Cyclists' Union (Fietsersbond), Fietsstad, Nijmegen.